Clove bud essential oil (3 ml) + Bay Laurel essential oil (organic) (3 ml) + Spikelavender essential oil (3 ml) + Solub-HE (10 ml) . Prepare this recipe in a 30-ml amber glass bottle. Add 5 drops of this mixture in a glass of water. Shake, the SOLUB-HE allows the dispersion of essential oils in water. Use as a mouthwash after every meal. Clove bud essential oil (2 ml) + Bay Laurel essential oil (organic) (2 ml) + Cajeput essential oil (2 ml) + Calendula macerate (organic) (8 ml) . Mix these ingredients in a small amber glass drop dispensing bottle. Apply with (clean) fingertips 1 to 2 drops of this mixture to affected areas up to 4 times a day (for 4 days). During the day, use in complement a mouthwash following every meal. Clove bud essential oil (1 ml) + Litsea cubeba essential oil (1 ml) + Peppermint essential oil (1 ml) + Moroccan chamomile essential oil (organic) (0.5 ml) + Neem Oil organic (20 ml) . Prepare this lotion by mixing all the ingredients. Apply the drops locally (on the areas to be treated), three times per day. Clove bud essential oil (3 drops) + Olive oil (organic) (9 drops) + Lavender essential oil (3 drops) + Bay Laurel essential oil (organic) (3 drops) . Mix essential oils and vegetable oil and massage the gum 3x/day for 3 days. Clove bud essential oil (2 ml) + Bay Laurel essential oil (organic) (2 ml) + Maillette Lavender essential oil (2 ml) + Macadamianut Oil (organic) (6 ml) . Apply this mixture to the aching tooth 3x/day for a few days. You can also use this mixture for mouthwash. Do not swallow. Clove bud essential oil (2 drops) + (2 drops) + Basil exotic essential oil (organic) (2 drops) + Winter Savory essential oil (organic) (2 drops) + thyme thujanol essential oil (2 drops) + Baobab Oil (organic) (10 drops) . Massage the lower back as well as the lower abdomen 3x/day with a few drops of this mixture. Clove bud essential oil (1 drop) + (1 drop) + Basil exotic essential oil (organic) (1 drop) + Baobab Oil (organic) (10 drops) + thyme linalol essential oil (1 drop) + Winter Savory essential oil (organic) (1 goutte) . Mix all these ingredients and massage the back and lower abdomen, morning, noon and evening until improvement of symptoms. Clove bud essential oil (1 ml) + Basil exotic essential oil (organic) (1 ml) + thyme thymol essential oil (organic) (1 ml) + Sage essential oil (1 ml) + Peppermint essential oil (1 ml) + (1 ml) + (1 bag) . Mix the essential oils in a 10 ml bottle. Pour a drop of synergy on a tablet and swallow (one in the morning one in the evening). Duration: 3 to 4 weeks. 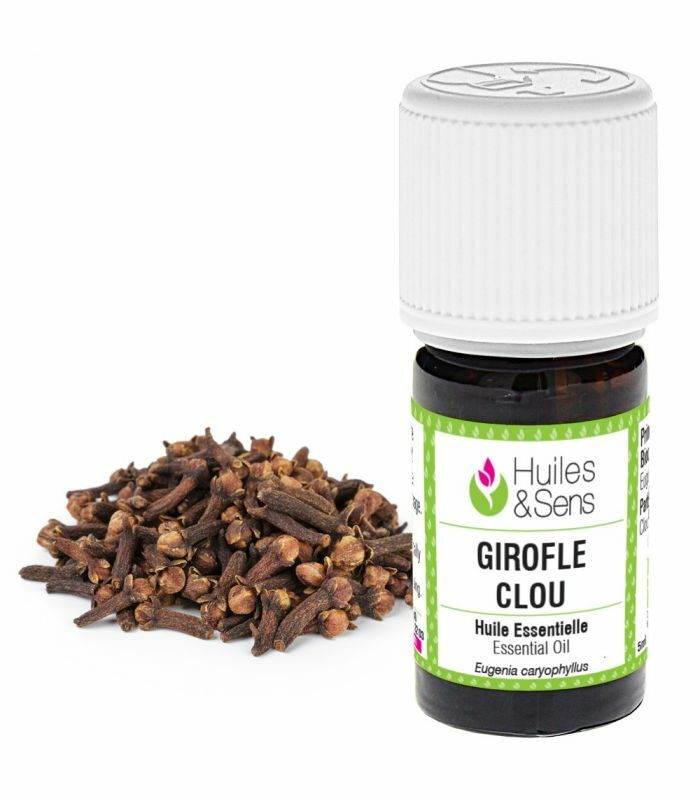 Clove bud essential oil (2 drops) + Bay Laurel essential oil (organic) (2 drops) + Sweet almond oil (organic) (12 drops) + Myrtle essential oil (2 drops) + Maillette Lavender essential oil (2 drops) + Cistus essential oil (2 drops) . Mix all ingredients and massage aching gums with this preparation 3x/day. Clove bud essential oil (1 ml) + Roman chamomile essential oil (1 ml) + Basil exotic essential oil (organic) (1 ml) + Peppermint essential oil (1 ml) + Wintergreen essential oil (1 ml) + Lavandin essential oil (1 ml) + Jojoba Oil (organic) (50 ml) . 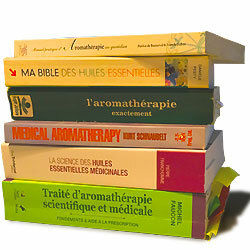 This preparation brings a synergy of essential oils to soothe effective headache. Apply a few drops in circular massages at the temples and neck. Clove bud essential oil (1 ml) + Myrtle essential oil (1 ml) + Sweet almond oil (organic) (10 ml) . Pour all ingredients (essential oils and vegetable oil) in a glass vial of 15 ml. Mix well. Apply 4-5 drops of this mixture on the wrist, three times a day for 1 week. Clove bud essential oil (1.5 ml) + Juniper essential oil (organic) (1.5 ml) + (1.5 ml) + Oregano essential oil (2 ml) + Winter Savory essential oil (organic) (2 ml) . These essential oils possess properties to remove warts. Apply only one drop on the wart twice a day until it disappears (in 2 to 4 weeks).